An animal can experience a fatal blockage if he swallows packaging material while attempting to eat the residue off of it? An animal’s head can get stuck inside certain plastic and glass containers causing suffocation or overheating? In particular, certain yogurt containers that are narrower at the top and wider at the bottom are especially dangerous for animals. Six-pack beverage rings can get stuck around an animal’s nose, mouth and neck, blocking off her means of breathing, eating, drinking and self defense? Broken glass and sharp edges on cans can cut an animal’s paws and mouth as he attempts to eat food residue off of them? Rinse all of your recyclables to remove residue and odors. Put lids back on containers tightly. If the lids have been misplaced, crush the containers. Use a can opener that opens cans beneath the lip of the lids, leaving only smooth edges on the cans and lids. Make sure to completely separate lids from cans. Cut up all six-pack beverage holders and other similar packaging so that there are no closed rings. Use critter-proof trash containers. Like Trash Knight. Recycle all plastic bags at your local grocery store. Don’t put plastic bags in the trash. Cut fishing line up into small pieces or tie it into a secure bundle so that it cannot be unwound. Switch to brands that have less packaging and buy food in bulk to avoid creating excess trash. Spread the word! Teach your kids, friends, and family to do the same! A Necessary Home Accessory…the trash can. One of the most necessary items for the home, yet one of the most unnoticed is the trash can. We mindlessly toss a crumpled piece of paper its way, shove it haphazardly underneath our sinks and toss them around our backyards until trash night comes. Q. What can the TRASH KNIGHT do for me? A. The main use of the TRASH KNIGHT has always been to keep animals out of residential garbage, but it does other things as well. 1. 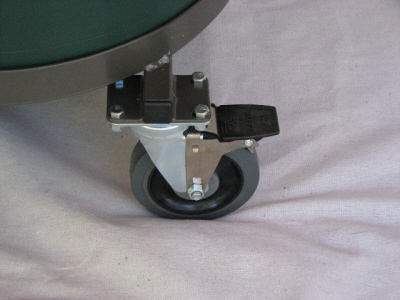 The rolling and towable models are an excellent mobility aid for older folks or a simple convenience for anybody who doesn’t want to make multiple trips to the curb lugging heavy trash cans. Your garbage can be taken out on ‘trash night’ (the night before your trash service comes), to avoid having to take it out before dawn on ‘trash day’ for fear of animal intrusion. 2. The TRASH KNIGHT can get your garbage cans out of the garage. Tired of that odor when you go to get in your car? 3. The TRASH KNIGHT opens your cans for you. No more prying unsanitary lids off. Taking the garbage out is now ‘touchless’. Germaphobes rejoice! 4. Reduce your trash can expense. The Rubbermaid BRUTEtm trash can is an extremely tough commercial grade product. They are expensive, but last a very long time, and the Trash Man can’t throw the lids when they are attached to the unit. In fact, my trash man likes the fact that he never has to pick up my trash so much that he has agreed to gently place my cans back in my TRASH KNIGHT rather than tossing them on the ground. 5. 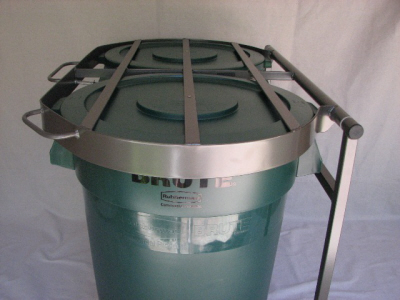 The TRASH KNIGHT can be used for storage of animal feed of almost any type. From rabbits to horses, one of our models can simplify feeding time and ensure varmint proof storage. Q. What trash can does the TRASH KNIGHT use and why? A. The TRASH KNIGHT uses the 32 gallon Rubbermaid BRUTEtm trash can for one reason- they are the best. They are not inexpensive ($30.00 each at the big box stores), but they hold up very well, which creates value in the long run. We have customers that have had the same set of cans for over ten years. They will not crack even when smashed badly. During destructive testing, we put ten gallons of water in them, froze them solid and threw them as far as we could without damage. My children have used the lids as Frisbees and were only able to damage our vehicles. Try that with an $18.00 can.